Amish and Mennonites hail from the same Anabaptist spiritual heritage, and depending on how progressive the church in question is, Mennonites may have a lot in common with Amish, including plain dress, restricted use of technology, and firm stances on non-resistance and other issues. More on comparing Amish & Mennonites. 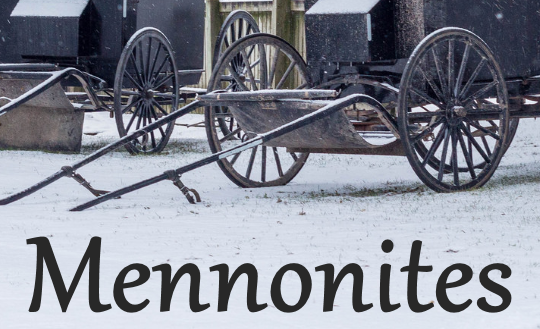 There are many different Mennonite churches, from horse-and-buggy churches to those whose members are indistinguishable from the majority of society. Generally, Mennonite churches are more liberal in terms of technology use, the practice of social shunning, and other issues. However, the most conservative Mennonite churches are similar to Amish in many ways (e.g. Old Order Mennonite churches), though they still typically differ on technology usage as well as place of worship (the home for the Amish, vs. meetinghouse in the case of Old Order Mennonites). There are many Mennonite churches, from the conservative and Old Order churches with distinctive dress or cultural practices, to “modern” Mennonite churches whose members are fully assimilated in modern society. Estimates place the number of Mennonites worldwide (of various persuasions) at over one million. 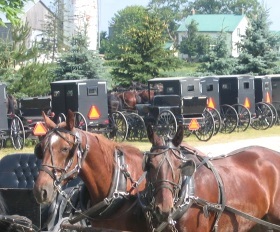 Old Order Mennonite carriages. Elmira, Ontario. These are the Mennonite churches which bear the closest resemblance to Old Order Amish. Old Order Mennonites (also known as “Team” Mennonites) use the horse-and-buggy, restrict technology to varying degrees, wear plain clothing, and speak Pennsylvania Dutch. As with the Amish, there are different groups within the Old Order Mennonite churches, some more traditional and others more liberal. This interview goes into greater depth on Old Order Mennonite culture and practices. Yes. One of the best examples of Old Order Amish and Old Order Mennonite cooperation is found in the joint parochial schools of Lancaster County. Amish and Mennonites of various churches also cooperate on charity and mission efforts (disaster relief projects, for example), auctions, and business matters. Menno Simons was an early Anabaptist leader who gave the religious group its name. Simons was a 16th-century Dutch priest who converted to Anabaptism. This conservative Mennonite branch is primarily found in Mexico, Latin America, as well as a small presence in Canada and the United States. They originated from the “Old Colony” of Chortitza in Russia. Old Colony Mennonites share some aspects in common with Amish and other conservative Mennonites, such as plain dress and limited technology, but speak a different German dialect. View photos and more info on Old Colony Mennonites. The Beachy Amish church formed in 1927 with roots in the Old Order Amish church. They share similarities with the Amish including dress, similar religious doctrine and practices such as footwashing. However members of Beachy Amish churches drive motor vehicles, use computers and other technology to varying degrees, and are more actively mission-oriented than Old Orders. Read more on the Beachy Amish. Horst, Isaac R. A Separate People: An Insider’s View of Old Order Mennonite Customs and Traditions. Waterloo, Ont: Herald Press, 2000. “Worldwide Mennonite Statistics 1978-2003.” Mennonite Church USA. Mennonite Church USA, n.d. Web. Accessed 2 Mar. 2015. <http://www.mcusa-archives.org/resources/membership.html>. Kraybill, Donald B, and Carl D. Bowman. On the Backroad to Heaven: Old Order Hutterites, Mennonites, Amish, and Brethren. Baltimore: Johns Hopkins University Press, 2001. Kraybill, Donald B, and James P. Hurd. Horse-and-buggy Mennonites: Hoofbeats of Humility in a Postmodern World. University Park, Pa: Pennsylvania State University Press, 2006. To Cite this Page: Wesner, Erik J. “Mennonites.” Amish America. Erik Wesner, 28 Feb. 2015. Web. [Date Accessed]. <http://amishamerica.com/mennonite/>.